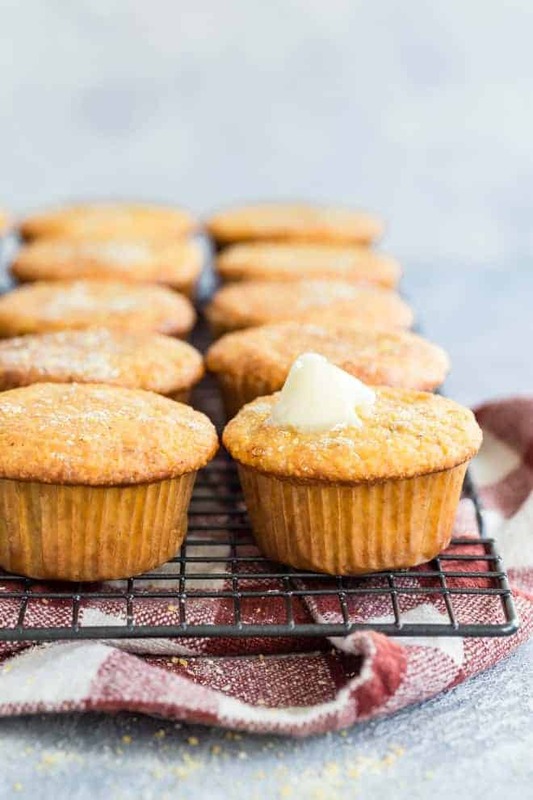 Corn Muffin Recipe – These moist, sweet and perfect corn muffins are way better than any box mix! Drop the box and make them from scratch!! I must admit corn muffins made with Jiffy was a mainstay in my house growing up. It was sweet, moist, and most importantly quick. If you had a box of Jiffy in your pantry, a world of possibilities opened up. With just a few ingredients tossed into the mix, cornbread deliciousness could happen. When I started making cornbread from scratch, I could not imagine using Jiffy or any box mix going forward. I wondered why I didn’t always make it from scratch since it was seriously so easy. 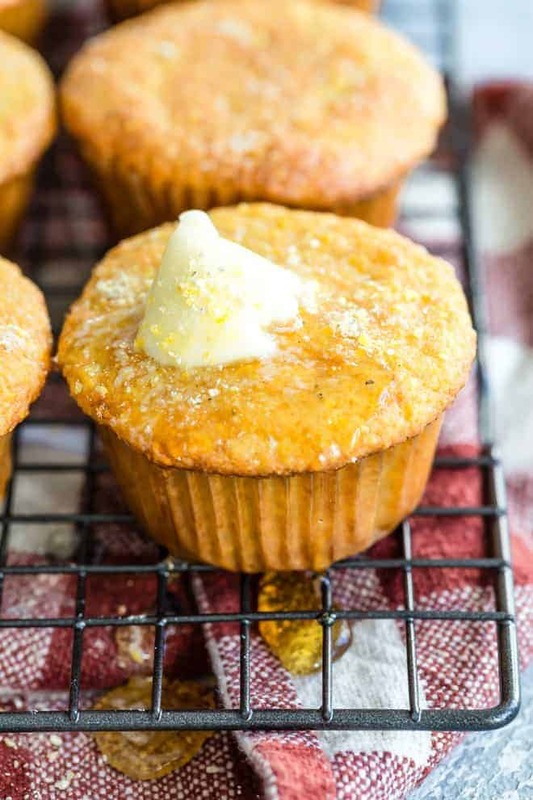 After working on several different recipes, I wanted to create a corn muffin recipe that reminded me of the ones straight out of the box from my childhood. These definitely fit the bill. These corn muffins are seriously moist which is extremely important. Cornbread can sometimes have a reputation for being too dry so I took that out of the equation by adding both sour cream, oil and buttermilk. The tang of the buttermilk is also incredible for flavor. I also added a nice dose of sugar to these babies. I happen to like sweet cornbread even though my people are from the South and swear sweet cornbread is blasphemy. I figure you can just scale back some of the sugar if it is too much for you. 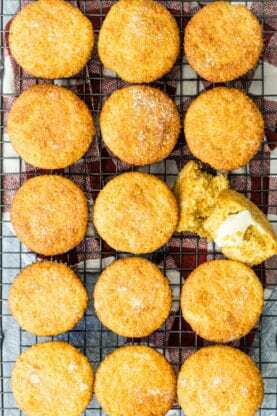 The end result is a perfect corn muffin that tastes absolutely sensational. Make these in one bowl and see how easy it can be. Whether you serve them with a big heaping bowl of my fajita chili or eat them alone, I guarantee you will rethink the box next time. 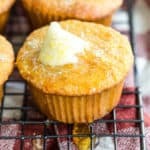 Corn Muffin Recipe - These moist, sweet and perfect corn muffins are way better than any box mix! Drop the box and make them from scratch!! Preheat oven to 400 degrees and line muffin pan with muffin liners. In a large bowl, whisk together cornmeal, flour, sugar, baking powder, baking soda, and salt until combined. In a separate medium sized bowl, whisk together buttermilk, egg, oil and sour cream until combined then pour wet ingredients into dry ingredients and mix until it just comes together. No need to overmix but make sure it is well combined. Add batter to muffin liners going about ⅔-¾ of the way up and bake for 14-20 minutes or until a toothpick inserted into the center of the muffin comes out clean. Allow to cool and enjoy. Cold cornbread dipped in Katsup is a dessert or breakfast made in heaven! Give this a try, I promise you’ll love it! I’ve tried many, many years to make corn muffins as yummy as Jiffy and a few other box mixes, and this recipe was on point for the job! I’ve tried so many recipes, and then never tried them again, but this one I’m keeping!!!! I served it with turkey tortilla soup with fresh avocado, and those muffins were the perfect addition!! Thank you so much for sharing this with us, Jocelyn!! Also, even though I’m a southerner, I LOVED the sugar!!! going forward. Thanks so much. Hooray that’s so fantastic. I would LOVE to know what you did to make it totally vegan and what other grinds and cornmeals you end up using so I can share with my followers!!! Keep me posted. I could think of so many things that this cornbread would compliment. I will have to whip these together soon. Few things beat homemade corn muffins fresh from the oven! I never thought to make these homemade! Love it! mmmm…these corn muffins look incredible!! Can’t wait to try this recipe!! Such a great idea to make cork muffins! I need to try it! Love corn muffins warmed up with butter! These look delicious! I totally do as well!